The CST61SS stainless steel standard extractor is a practical addition to any kitchen, with 3 speeds and push button control. It also has a lamp and a glass light diffuser which disperses light evenly for a softer illumination. The CST61WH white standard extractor is a practical addition to any kitchen, with 3 speeds and push button control. It also has a lamp and a glass light diffuser which disperses light evenly for a softer illumination. The CDA EIN60SI 60cm extractor is integrated so that the extractor remains inconspicuous in your chosen kitchen design. It has 3 speeds with slider control and a built in LED light to allow good illumination of the hob. 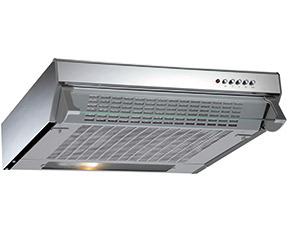 The CCA51SI is a 50cm canopy extractor with slider control. It can be ducted out or fitted with re-circulating charcoal filters. It has 2 speeds and LED lights for flexibility and ease of use whilst cooking. The CCA51WH is a 50cm canopy extractor with slider control. It can be ducted out or fitted with re-circulating charcoal filters. It has 3 speeds and LED lights for flexibility and ease of use whilst cooking. The CCA71SI is a 70cm canopy extractor with slider control. It can be ducted out or fitted with re-circulating charcoal filters. It has 2 speeds and LED lights for flexibility and ease of use whilst cooking. Just because you need extraction in your kitchen, doesn’t necessarily mean that you want to make a big song and dance about it. If statement extractors are not really your thing then take a look at our integrated range. Practical and easy to install, the integrated extractor range offers effective air filtration for kitchens with wall units, canopies or limited space. Simply decide whether you would prefer to duct your extractor to the outside or recirculate filtered air back into your kitchen and either go for the corresponding ducting kit or charcoal filter set. You can order your ducting kit through your retailer so that they can install it at the same time as the extractor. If you go for filters then you can either order them through your retailer or telephone our Head Office to get them posted straight to your home address. If you click on the corresponding product page for your extractor, you will see the appropriate codes for ducting and filters in the technical specification. These integrated cooker hoods are ideal for installing in built-in wall cabinetry and discreetly work to remove steam, grease and cooking smells quickly and effectively from your kitchen. They feature a built-in light to provide practical illumination over your hob area, which is perfect to cook by. Being integrated, there is less surface area to clean on the exterior of the extractor, which will dramatically reduce your kitchen cleaning chores. The grease filters are also easy to clean as they click in and out and can be run through your dishwasher to freshen them up and remove any build-up of residue. The charcoal filters, if you have opted for recirculating extraction, are disposable however and will need to be periodically replaced. We recommend, based on the average family household’s usage, that you install new charcoal filters every 6 months. You can adjust this depending on whether you use your kitchen more or less frequently than this. The integrated range features 3 extraction speeds that allow you to change between power levels according to your requirements and a pull out canopy so that the cooker hood impact can be minimised in your kitchen when not in use. The CTE6, for example, even has a slide out section at the front to extend the extraction area and maximise absorption of grease and steam while you are cooking. With overhead illumination from built in lighting, cooking is made easier with the help of an integrated extractor. Aluminium grease filters can be dishwashed to keep your extractor clean and running efficiently. What’s more, you can choose between white or stainless steel on some models to integrate your extractor perfectly with the rest of your design. Simple and practical, our integrated extractors are understated and perform well whilst being an affordable and easily installable size for most kitchens. If you are not sure which model is right for you, visit our buying guide for more information on cooker hood sizes, functions, features and noise levels to help you make the right decision.